1982 was a big year for St. Enda’s as it marked the 50th anniversary of the club’s foundation. At that time, the club’s headquarter was in a former warehouse just off the Gortin Road (currently occupied by Cleantec) and it proved to be a popular venue for various club social activities. 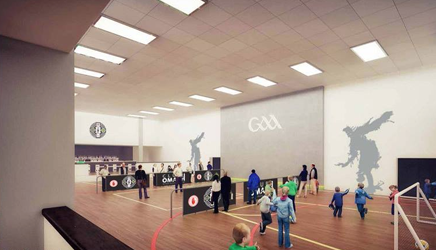 One of the biggest projects to be overseen by this committee was the development of the current clubrooms at Healy Park which was opened in 1984. If you have any old St. Enda’s photographs which you would like to see featured on our Monday Memories slot, please contact Dominic McClements at pro.omaghstendas.tyrone@gaa.ie or 07725351643. Jubilee year. The St. Enda’s Executive Committee of 1982 which oversaw the club’s 50th Anniversary. Back row (left to right) – Eugene McMahon, Donal McEnhill, Desmond McClements, Brendan McAleer, Michael Gilheaney, Paddy Devlin, Sean Healy, Vincent Young. Front row (left to right) – Eamon Tracey, Dan Deveney (RIP), Michael Brogan (Treasurer), Declan O’Neill (Chairman), Jackie Martin (Secretary), Anne Cullen.